A couple of items caught my attention recently: one a campaign to get children to read, and the other a blog on reading done by Ghanaian children. The first has actually been on the radio, specifically on JoyFM for the last couple of weeks or so, only because I don’t listen to the radio at work, I have not actually heard any of the kids read, or the interviews or anything else, except basically the trailers for The Read100 project. It does sound like a good idea, and certainly the comments – in contrast to what usually happens in response to JoyFM’s news stories – are extremely positive and constructive. My only concern lies with the choice of books: the first book is Meshack Asare’s The cross drums, which is published by Sub-Saharan, a small Ghanaian publisher with generally high standards. I suspect however that the issue will not be one of interest, but rather one of supply. How many of the local bookshops have the book in stock? Was the project discussed with them? And what about future books? The other item was a post in the Wo Se Ekyr: what yo’ Mamma never told you about Ghana blog. Lots of comments on the post, which in my view is proof that Esi Cleland obviously pushes some of the right buttons! I do wonder how come reading seems to be a topic of the moment? Commonwealth Writers’ Prize regional winners’ shortlist includes two Ghanaians! I feel proud to say that I have read both of the works written by Ghanaians which have been included in the 2010 Commonwealth Writers’ Prize regional shortlists. 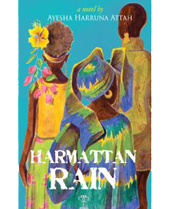 Ayesha Harruna Attah’s Harmattan rain, which is shortlisted for the Africa regional first book, which I mentioned earlier. 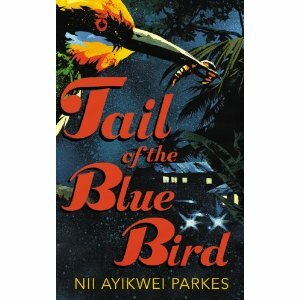 Nii Ayikwei Parkes’ Tail of the blue bird, which is shortlisted under the South Asia and Europe category for a first book. I did mention in an earlier post having considerable palaver in actually getting a hold of this book, but once I did I actually enjoyed it. Not surprisingly the rest of the African nominees were either from South Africa or Nigeria. But still I do feel pretty proud. Yeah Ghana! Unfortunately there hasn’t been much coverage of this news in the Ghanaian press, apart from an article in The Daily Dispatch of 23 February 2010 – not online though, so I can’t include a link. Maybe there will be more in the next few days?